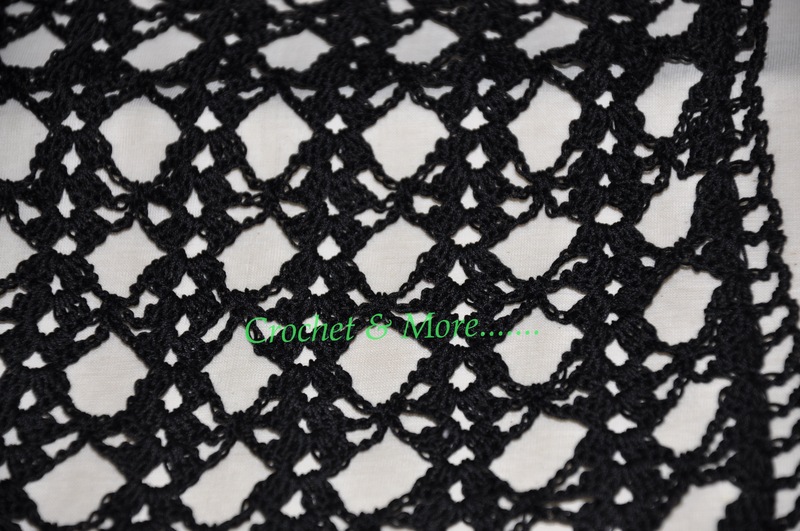 My sister, who rarely ask me for anything, was going through my FB page Crochet & More and fell in love with the Irish crochet scarf that I had done.. She wanted one of those…..but I had just finished hooking up 3 of them and was a little bored with doing the same thing. So I hooked her this scarf……and guess what?…. she loved it!!!! This is a very gentle and innocent stitch pretending to be glamorous and sophisticated….and if you are wondering what I mean by that is……though the stitch looks complicated it is very simple to do and is addictive. Omega cotton Thread from Coats #10 – 100 gms. This is the chart that I worked from: This pattern is from the internet. 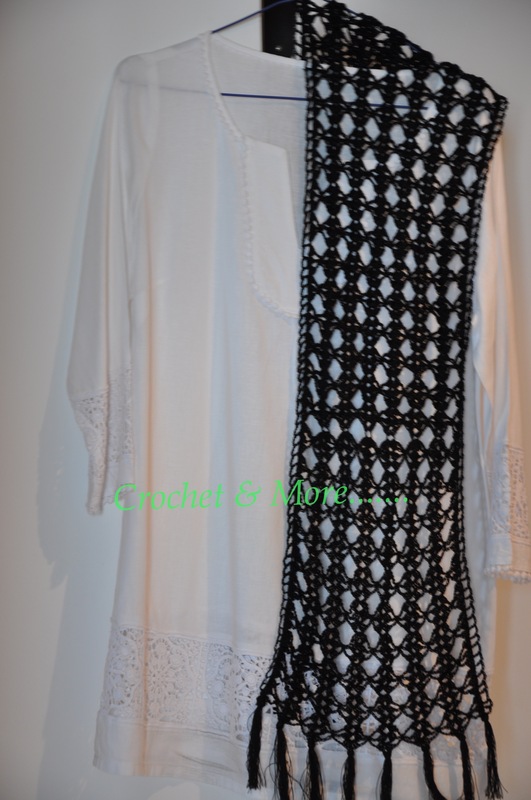 I did do my own thing, in that, I hooked in a mesh stitch on either side of the scarf. I first worked with #5…which is a very light thread, building in the middle portion of the scarf…..then I worked #10 on both sides…#10 is not as soft as #5…so it weighs a little on both sides and then when you add the #20 as tassels…the whole project holds the length and shape…There is no need to starch this scarf. Row 3: 3ch up, 3dc in the same chain; *5 chain, 3dc in the 3ch loop created by the two 3dc cluster in the first row. ; 3chain; 3dc in the same loop*. continue ** until end of row. Row 4: 3ch up , 3dc in same chain; *3chain; 1 sc is made gathering the 7 ch of the first and second rows: then 3ch; 3dc in the previous row’s loop 3ch 3dc* continue until end of row. Now you have created your first diamond Lattice. I made 34 rows of diamond Lattice in Pearl #5 then switched to #10 for 10 rows. Cut the yarn, and attached it to the other end of the scarf where I had first begun. So now you are hooking into #5 thread with #10 thread. What you get is a thicker and softer middle portion (the part that goes around your neck. )..and both the ends of the scarf are daintier becos you have hooked it with a #10. I also wanted the zigzag design as the border….I thought it looked more interesting. I made 54 rows of Diamond Lattices. To give the 2 long sides of the scarf a lacy feel I crocheted a mesh stitch along the sides using Omega from Coats #10 thread. I made the tassels with Anchor #20……just t wanted it to look more daintier and delicate…..Here is a very good link that shows you how to make tassels…. 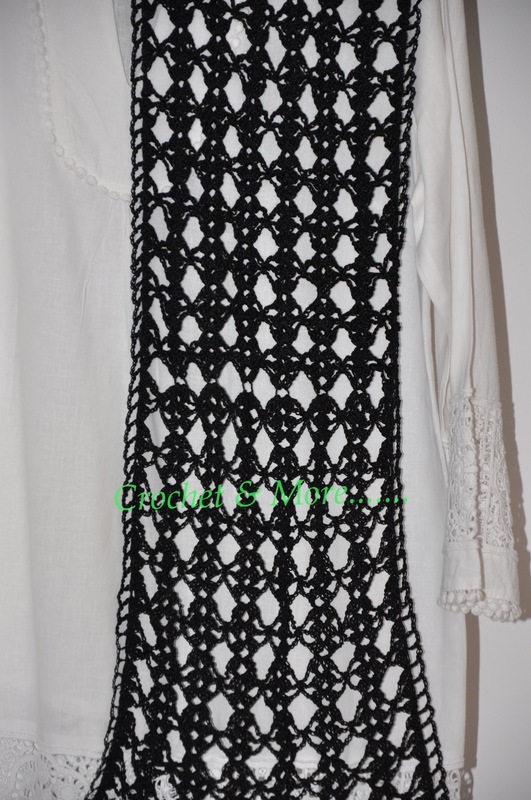 Well…here we are at and that’s how simple this scarf was to make……Enjoy…and Keep that beautiful smile on always…. Suja….You must it’s so easy and the look is great!